Executive Orders are constitutional and have been around since George Washington was President, but many would agree Obama is abusing the powers of the Office of the Presidency. Others seek to defend Obama. Every time Republicans or Conservatives attack Obama's lawlessness and end runs around Congress, his enablers claim he hasn't issued anymore Executive Orders than former President's Bush and Clinton. That is true on the surface. Obama has issued 182 EO's since he took office. Bush issued 287 in 8 years and Clinton issued 308 during his two terms. Many claim Obama's EO's are broader in scope or larger in impact than EO's that have been isued in the past. Without researching all EO's I can not agree or disagree with that claim. 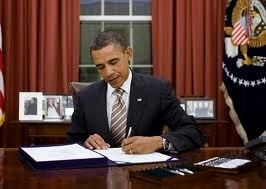 Barack Obama has issued EO's to change the minimum wage for federal contractors and to fight alleged climate change. Those are pretty weighty and politically contentious topics, but many are mundane. The truth is Barack Obama cares so little for the Constitution, he doesn't even dignify his lawlessness with an official Executive Order. That may seem contrary to what everyone thinks they know. For instance, we all know Obama issued an Executive Order on June 15, 2012 to defer deportation for the so-called Deamers. We were told that by many in the media. The truth is no Executive order was issued. Read the entire list of Obama's EO's here and you will not find one dealing with Dreamers. What about the 41 lawless changes Obama has made to, Obamacare, the Affordable Care Act? There must be some Executive Orders relating to those. Nope. Not a single one. Obama changed immigration law with a memorandum and healthcare law with regulations from the Department of HHS. The way Obama is doing an end run around the law and Congress certainly allows his supporters to have a good talking point about how he hasn't issued anymore EO's than other Presidents. It doesn't negate the fact he is making unlawful changes without even the thin constitutional cover of an Executive Order.